Thinking about starting a nonprofit organization and don't know where to start? Or is your nonprofit already off the ground and you'd like to take it to the next level? 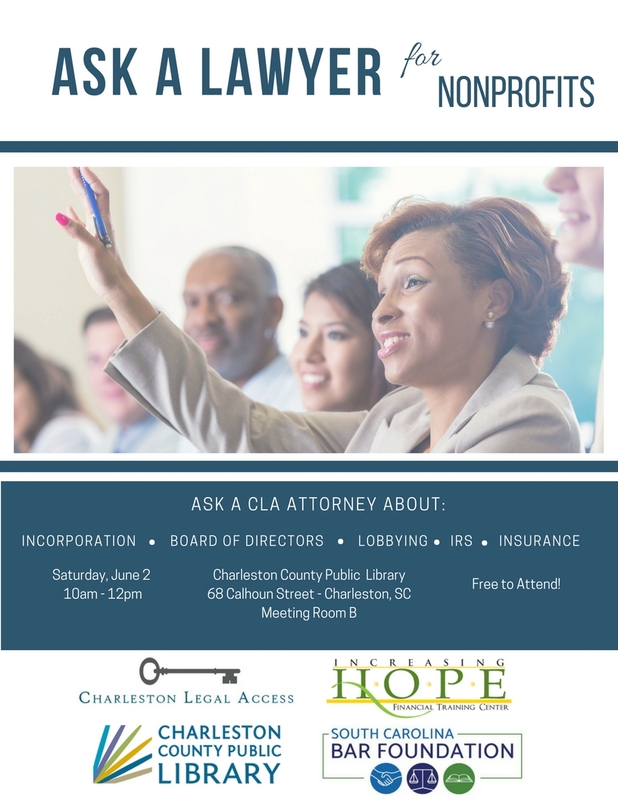 Thanks to the generosity of the South Carolina Bar Foundation and the Charleston County Public Library you can join CLA's staff attorney and Increasing Hope for a free 90 minute info session followed by Q&A. Topics of discussion will include: incorporation, choosing your board of directors, obtaining a 501c(3) status and many more. To RSVP please contact Shelli Gause at admin@charlestonlegalaccess.org or 843-640-5980 ext. 4.